Last week, Monmouth University released some new polling on Americans’ attitudes towards transportation infrastructure, and who’s responsible for fixing our roads and bridges. Overall, respondents would like the President, Congress and the states to give more attention to — and more investment in — transportation infrastructure. • Responses to the survey did not necessarily correspond to the state of their roads. The study compared respondents’ opinions with the FHWA bridge condition inventory. • The discussion in Washington is different than that on the ground. • In Washington we talk often about failing bridges, but respondents are more concerned with local roads. • Respondents are split on whether the Trump infrastructure plan will be implemented. Transportation stakeholders in Washington are more convinced it won’t happen. • A majority of respondents blame Congress and President Trump equally for the failure to get an infrastructure plan through; the rest of respondents put more blame on Congress than Trump. When asked about the state of transportation infrastructure in their area. A majority believed some or all of the roads in their area were in need of urgent repair, 31 and 34 percent respectively versus 27 percent who said just a few of the roads in their area were in need of repair or seven percent who said none. When asked the same about bridges in their areas the numbers fell to 25 saying some needed repair and 18 percent saying most needed repair. 22 percent of respondents said just a few, and 19 percent said none were in need of repair. 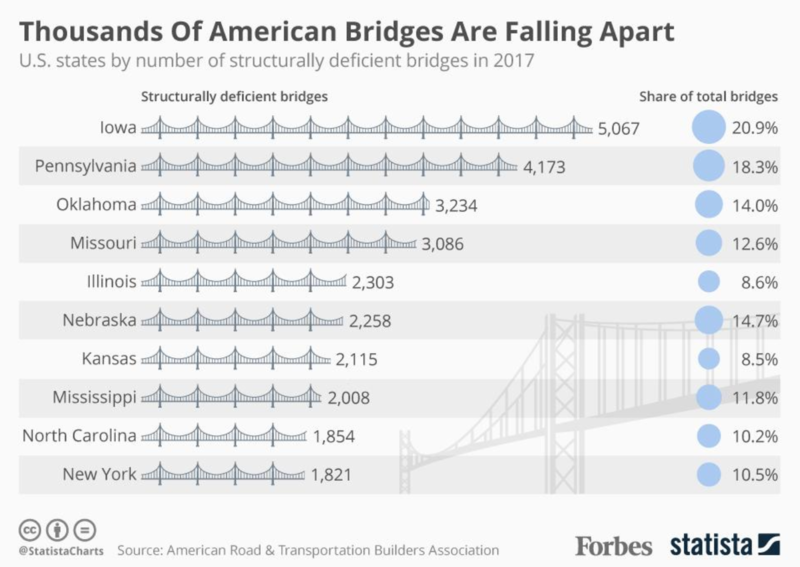 This is interesting because in the federal debate, lawmakers and stakeholders are constantly stressing that over 54,000 of bridges in the United States are structurally deficient. While nationally that is nine percent of bridges in some states it is much higher. The percentage of the population who believe their roads and bridges are in good shape varies by region. In the Southwest and the Mountain West 48 percent of respondents rate their transportation infrastructure as good or excellent. That is higher than respondents from the West Coast (37 percent), the Southeast (34 percent), the Midwest (32 percent) and the Northeast (28 percent). There is no significant difference to opinion based on the FHWA rating of bridge conditions in each county. 62 percent of respondents believe that the federal government is not spending enough on transportation infrastructure versus 19 percent who believe the federal government is spending the right amount, and four percent who think the federal government is spending too much. When asked about the State’s responsibility, 57 percent said their state is not spending enough vs the right amount (25 percent) or too much (10 percent). 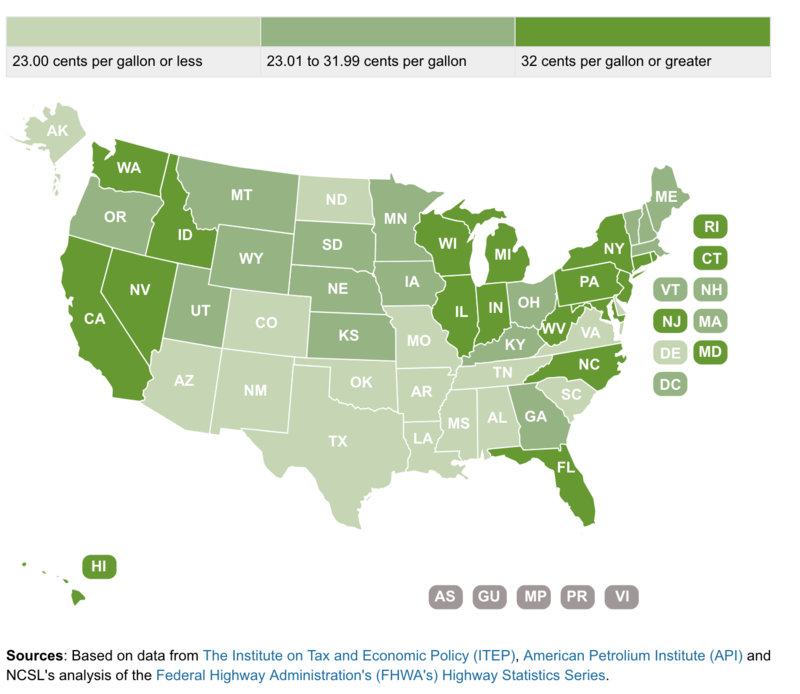 This may be frustrating for the 26 states and the District of Columbia who have taken action to raise their gas tax or index it to inflation. Across the country, the public has been willing to raise their own taxes when it goes to transportation, especially at the local level. Roughly 70 percent of transportation ballot measures pass, with 90 percent passing in 2017. The question of raising the federal gas tax had re-entered political discussion this year during the tax reform discussions. However as that discussion moved from tax reform to tax cuts, the discussion on raising revenue for investment in transportation fell out of negotiations. There seem to be a mixed sense though that other areas were doing better or worse. A plurality, 46 percent, believe that its area is getting its fair share of transportation infrastructure investment versus 43 percent who thought its area wasn’t. No one thought their area was getting more than its fair share. Whose responsibility is it at the Federal level? Despite President Trump’s efforts to push for a large infrastructure package and introducing a package in February, 55 percent said the President was not giving infrastructure enough attention. Twenty eight percent said he was giving it enough attention, and four percent said he was giving it too much attention. Forty four percent believed that the President’s proposed plan was very or somewhat likely to pass (10 and 34 percent respectively) with 50 percent believing it was not too likely or not at all likely (25 and 25 percent). That is very different to the discussions in Washington, DC where most pundits and stakeholders believing the package was dead upon introduction. When asked who is more to blame if the plan does not become a reality, 53 percent blamed the President and Congress equally while 36 percent blamed Congress more, and only seven percent blamed President Trump. You can learn more about the data at Monmouth University Polling Institute.